If you plan on bunkering down for Apple’s new iPad – or perhaps the cheaper iPad 2 alternative – you might want to consider purchasing AppleCare+ for iPad. With it, owners will get the same level of protection iPhone 4S owners got last year. What, you ask, is covered? Let me tell you. 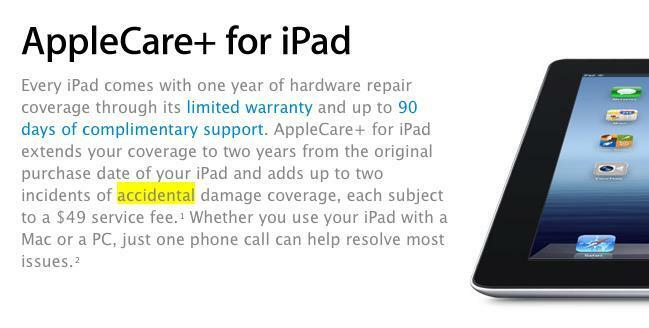 In addition to the complimentary one year of hardware repair coverage, AppleCare+ for iPad extends its support an extra two years from the original purchase date. That’s a total of three years. The best part is that AppleCare+ will cover up to two incidents of accidental damage – including the iPad itself and its battery – for a nominal $49 service fee. Sure beats hundreds of dollars in repairs. This is certainly an enticing option for those clumsier gadget owners out there (me). There is, as always, fine print attached to the exact meaning of accidental damage from handling.